My house is 100 years old this year. When I purchased it, it was a ways off from the big 1-0-0 and I didn’t think too much about the age, but now that we’re at the century mark, it occurs to me that this is a remarkable number. If the house were a person, a birthday card from Obama would be showing up this year. I never learned any house-handy maintenance tricks when I was growing up. My mother was a great gardener and both my parents were terrific at remodeling rooms, steaming off wall paper and hanging new. But other than that, neither of them was all that handy. Of course we moved around A LOT when I was growing up so may we weren’t in a house long enough for anything to go wrong. So I’ve had to learn my own maintenance skills. Luckily I live near a GREAT hardware store with great staff who are very patient with my questions; they didn’t even laugh when it took me FOUR trips one weekend to finally finish the great woodwork mitering project before Baby came. These days the internet helps as well; I was able to figure out how to change the insides of my kitchen faucet by looking it up on YouTube! Among other things over the years I’ve replaced sash windows, changed out electrical switches, redone the baseboard woodwork, cemented a gap between the house and steps and, of course, put in many new toilet flush valves and flappers. It’s always something around an old house. So this poem really resonated with me when I ran across it. Like an old man’s minor aches and pains. And straightened the hinge for the backyard gate. I felt an insane sense of satisfaction. Then I heard a great crash in the yard. The maple had fallen and smashed our car. “Handyman” by Barton Sutter from Farewell to the Starlight in Whiskey. © BOA Editions, 2004. Do you have a maintenance skill you’re proud of? Previous PostCreative Caretakers Spiff Up PropertyNext PostCongratulations, You’re a Winner! I skillfully and regularly drive my car to Jiffy Lube. I’m proud of all that paperwork in the glove compartment. I used to change the oil in my cars; it gave me a real “I am woman, hear my roar” feeling. But these days, it’s messy and then what do I do with the oil? So it’s up to Steve’s Auto, near my house, as they have a good oil change coupon on their website! I once maintained a C average. I used to do almost anything–painting, assembling, refinishing,cleaning, sewing. Most of this can be credited to 4-H projects in which I learned the skills as a child/teenager. I did get blue ribbons and took successful projects to the Iowa State Fair. Now, not so much. Arthritis in neck and shoulders snuck in complicating a lack of time. My husband does the repairs or I hire someone to do the task. But I take pride in knowing how to do this stuff. Good morning. I do most of the maintenance work around our house that can be done by an “amateur”. I hire professionals to do big jobs or jobs that are beyond my skill level such as more complicated electric wiring or detailed carpentry. When I was much younger I worked for two years as a roofer so, when it comes to rooting, I can do all of my own work which leads me to pick roofing as my best home maintenance skill. roofing is a hard one, just physically. carrying up the squares of shingles after you’ve taken up all the old shingles. the. replace the bad wood underneath and plug the raccoon holes and put down the ice back up paper before the tarpaper before the shingles go on. back when I did it you buy 50 lb boxes of nails at menards, today that air powered nail gun is the only way to go. cost on those guns is nothing it’s the nails that add up now in a roll. nails in a row,,, what’s this world coming to. up and down the ladder. rope around your waist so when you fall you will hang there, and then when you near eon the roof the angle is one that causes leg cramps just because it does. now go pick up the yard after the dumpster gets hauled off and find all those little nails on the ground so you don’t send them flying with the lawn mower. roofing is the hardest easy job on the planet. it hurts to think about it. It is informative to track which jobs are being done by Hispanics. They are invariably difficult jobs that pay so poorly that white folks avoid them. Roofing crews are increasingly filled with Hispanics these days. And the Hispanics I’ve seen doing roofing work HARD. I’ve been favorably impressed with their work. None that I can think of, but I’m not really awake yet. OT: If you haven’t read Linda’s story from late yesterday, it’s worth a trip back there. The laugh alone will recur all day. so what’s the basement in the 100 year old house? that’s often my favorite. my first guy house was on 31st and portland in a big old house on the blvd. it had beautiful wood work wonderful staircases claw foot bathtubs and enough bedrooms to house a bevy of guests and still be able to find space to sit quietly in a nook or a cranny. I was however e only person who loved the basement. limestone walls with shelves contours and little rooms for potatoes and coal. I had my art studio set up down there and would go just to get away. it was damp smelling but maybe that just served as a guard to keep the riff raff out? it was.a great house but rental in that part of Minneapolis 45 years ago was hard on houses. 249 a month allowed anyone to get in there. we got it by buying the Sunday paper on Saturday and checking the house out before going over to prospect park to find the landlord at 10 pm to do the deal before the sunday paper was delivered to the masses. he laughed and said that house often rented out before it got shown. it was big and beautiful and the neighborhood gangs burned the garage down shortly after we moved out and got the hose a while after that. the dining room woodwork and the basement are the two parts of that house I remember with the most fondness. do you have killer basement walls vs or are the just normal brick? Yeah, we have a killer basement. It’s is a dungeon with limestone walls, inhabited by creepy crawly critters; I hate it. And that’s where I have to do my laundry, yuck! That is my basement, too. I have a main floor laundry room off the kitchen, though. It was a priority when I remodeled. My skill is knowing when to hire someone to do the handiwork around my house. 😉 I’ve perfected that over the years and I hardly do anything that requires more than a screwdriver, a wrench, or a hammer. That’s the joy of being a renter, not having to do any of your own maintenance. I think I did a pretty good job of painting this place before we moved in, considering what we had to deal with (toxic incense residue and VIOLENTLY colored walls). I’m also the resident IKEA assembly maven, as my roommate can’t make head or tails of the instruction drawings. Last time I put something together, I didn’t even need to unscrew it to turn some piece or other around/over or add a bit I’d forgotten, which is the usual way it goes. A great cover and good titles are enough for me. And there are 4 copies in the Hennepin County Library system. 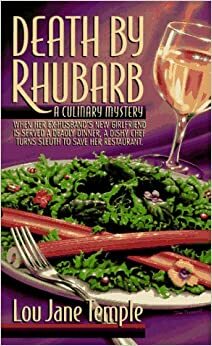 I read that Death by Rhubarb that Clyde came up with on the day we were talking about Renee’s potentially lethal plants. Great title, great cover. Not a great book – 2 stars only. I am reasonably mechanically inclined. Back in the day when things were more simply made, I could fix my own sewing machine and typewriter, and I did change the points and plugs on my VW bug once. But I never owned a home by myself, so never needed to learn a lot of those skills by myself. I am, however, a fabulous home repair HELPER. Husband and I have been doing this for so long, I can sometimes anticipate what’s needed next, go find that tool, and have it ready before he asks for it. Having a limited skill set and limited tools, I can manage minor repairs and renovations around the house. My sister, who lives in an old, needy house in south Minneapolis, has much bigger skill and tool sets and has learned to do many repairs out of necessity. Sometimes she can advise me on repairs but often I defer to those who earn a living fixing things. My best skill has nothing to do with tools. I am a darn good piano accompanist for children’s choirs (public schools and private choirs). Lacking upper body strength, I have a system to lift things that are large and heavy to get them up to the place I need them without endangering my back. First the object, often an air conditioner, goes from the floor to a tubular thing with wheels, about 6-7 inches high, so it can be wheeled to the location I want, where I have a footstool, a chair, and a stepstool arranged in from of the final destination, typically a window with a radiator in front of it. I lift one end of the object onto the footstool, then lift the other end and swing it around to lift it onto the chair, then lift the first end and swing it around onto the stepstool, and lift the second end and swing it around to the radiator. This way I don’t ever have to lift the full weight of the object. I have a patent on this method; you may use it if you like and pay me whatever you think it is worth. I know someone who uses that method, too, Linda. I wonder if he paid you for it? I have failed to maintain my innocence. I began my life as a homeowner proud and poor. I was too proud to admit I couldn’t fix things myself, but also too poor to hire union professionals who could do it right the first time. That set me up for a silly pattern: see a problem, attempt to fix it DIY, then hire a professional to clean up the mess I’d made. And I made a discomforting discovery. Doing It Yourself usually involved buying tools that defeated the plan to save money on the repair. When my kitchen garbage disposer locked up I bought a special tool to get it going. And then I never used that tool again. When I had to fix the plumbing below the sink I had to buy a special wrench to work in tight spaces. And then I never used it again. Then I found the answer. I discovered a network of home handymen who were proud of working below union wages. They were reasonably competent and yet they kept assuring me I was saving money by hiring them. The downside was that there were usually reasons these guys weren’t charging top dollar. I spent countless frustrated hours with Ed, my ADD handyman, as he dithered before actually starting a job, talking the job through with me (of all people) because he had a psychological need to rehearse the repair out loud, step by step, before he could begin. Ed was cheap, but only if I didn’t calculate in the value of my time as Ed talked to me before starting the repair. He became like an old hunting dog you keep around for years after he no longer could hunt, but gee you were fond of him. I discovered about 5 years ago that my hardware guys have a list of tradesfolk that they recommend. My plumber and my electrician came off this list and the next handy guy (current guy is moving to Wisconsin) will probably come off that list as well! Ah, but see, that IS the benefit: ‘Every Job is an opportunity for a new tool!’. That’s how you build the collection! I used to have an effective all-purpose maintenance tool called a Tom. I now have an almost as good Kevin who is still in the break-in period. I am a very good assembler, and I am good at assessing a home repair problem and what needs to be done, but lack experience in actually fixing the promlem. You get who you can out here in terms of repair folks, and hope it won’t take too long for them to show up. My latest doityourself maintenance project was to install a new kitchen faucet…without that special tool for tight places. It took the better part of a day and an painful abrasion on my arm from the bottom of the cabinet. But I got it done,damn it! OT: Still in Denver but traveling east to home today. Just learned that Houdini Horse found her way out of the pasture again last week. I have no maintenance skills — I married one, but he’s only somewhat competent at household stuff. When we did have the house, he hated doing yardwork and basically taught my 3 boys the same — so it rarely got done. Good thing we rent now. For a couple of years, roughly thirty years ago, I was a member of a West Side Handywoman group. We worked together on all kinds of projects under the guidance of a woman who was a professional in the construction trade. We’d tackled everything from tuck pointing to hanging sheet rock and everything in between. I have worked in and on any number of West Side homes besides my own. Can’t think of a single skill that stood out or was the source of pride, but there was a certain satisfaction in knowing you could fix things yourself – not to mention the money saved. But, frankly, these days I’d just as soon pay someone to do whatever needs to be done. Wish husband shared that sentiment. What a wonderful group to have in your neighborhood, PJ! My maintenance skills are like most of my other skills: repairing, cooking/baking, gardening, sewing. All very good and I can tackle quite a bit, except for one teensy drawback. My temporal skills are terrible. A couple of the other cross country moms and I go walking while our kids run. Tonight we got to talking about pickles and other methods of preserving all the great stuff available in abundance right now. Growing up with a large family garden and a mother who had much of the summer off because she was a teacher can really make you feel inadequate. Growing up in a farming community where this was the norm makes you feel even moreso. I can relate, mig. My mother always had a huge garden. Huge. And not only did she can and freeze and root cellar tons of food for her immediate family (plus for her parents who lived in a “mother-in-law apartment” in our house), but she did all the “putting up” for her sister and her family (two parents and four boys), too. We lived in Minnesota. They lived in Illinois. So there must have been some sort of exchange in the fall. And guess how much canning I do? None, zip, zilch, nada. I do throw some berries and fruit in the freezer, but that’s the extent of my “putting up” skills. Not to mention, any garden I have more closely resembles a jungle than a garden this time of year. I tried straw bale gardening this summer and totally failed at it. And anything that thrives pretty much takes over everything around it. I think I need a machete to restore order. If you find a machete, can I borrow it? What I find kinda sad is my folks were both teachers, so had at least two months of the summer off, but never did any vegetable garden. My dad said he’d been in charge of weeding during his (Depression era) childhood, and never wanted to go near gardening once he was up and out. I can fix things and do home projects but it’s helpful to me if you’re really not in any great hurry to have them finished. The deck took 3 years, the ongoing ‘entryway / mudroom’ remodeling is on about year 4. I mean they’re all useable, just a couple finishing touches needed. My Dad, he could fix anything. You wouldn’t want him to fix your fine woodwork unless you were OK with baling wire and some plier scratches on it, but machinery he could fix. And there’s nothing more satisfying than seeing my son finally begin to repair things on his own. I don’t think he was really paying much attention as a kid so he’s trying to catch up using Youtube and such — and that’s OK!— but it’s fun to hear him talk about fixing a chair for a college roommate, or fixing something at the apartment now. my oldest took the day to do his brakes for the first time yesterday. he started about 12 with is laptop and the youtube videos of rear brakes for his year make and model and began. about 2 he called and wanted to know a certain tool was. at 8 i got home and he had just snapped off a bold and wanted to know how you fix that. he has day 2 scheduled for the finishing touches today. it will be interesting to see if he starts earlier that 12 today. he and i have done them before. this is his first time solo. i got home and he had the car jacked up only a little bit. i asked how he got under there to crank on the bolts and he said he was concerned about the car falling off the jack on top of him. i told him thats what the axel stands were for. we have 4 of them. oh was all he said. ill get them out for him this morning. Brakes are always fun to me. The old drum brakes are full of springs and while they look complicated, they’re really not too bad if you pay attention. But jackstand / axel stands; they are important. Has the tow truck arrived to take the auto to a regular shop? nope he found a mechanoc who is his new best friend that huided him through it. Could you say that again, tim? I didn’t quite catch that. Morning all. I guess we’re on our own again today. I just put another piece up but since Dale’s at work already, I guess he won’t be able to publish it until tomorrow. OT – Blevins Book Club is this Sunday. 2 p.m. Minnehaha. We can do my place if weather is crummy. Where at the park do we meet on Sunday? Near Sea Salt. Sometimes we can get a table under the pavilion, sometimes we have to snag a table elsewhere. I might even bring a big blanket if we need to “picnic it”! Thanks for offering to be back-up location, VS. We have three things on Sunday… I will be there but perhaps not right away. Don’t be too late… as I recall our book was your idea. I’m on page 646 right now! i am guilty of not getting the hidden blogs uncovered yesterday. i have these new sort of computers in my life instead of having my computer and stuff hides on one and not the other so i end up looking in 27 places for the missing thing. organization is a thing. i need to work on it. Woops, I’m feeling a little guilty too – meant to get one in yesterday, will finish one today. I hope it makes for good blogging because the class itself and the teacher are fun. I am off feeding my soul which is the best maintenance of all. This weekend I am going to see my mother in Iowa–I have been absent there for 2 1/2 months due to home project and must do this. I cannot attend the 5th Anniversary of BBC, sadly, although I was an original attendee. Have a fun celebration. My renewed soul will attend in spirit! Like. Are you still interested in the sunrise painting? Yes. Just not home much this week to facilitate anything. Not this week or next week for sure. Just wanted to know your interest to give you the size, etc. Image size, not the paper size, but the image that would show through the matting is 8 by 11 inches. Contact me at birkholzclyde@gmail.com so I can send other details. I have photos I shot of all the original BBC attendees. That was an odd moment: meeting in person the folks we only knew from the way they wrote on TB. That would be a fun photo! What I remember best is that without discussing it ahead of time, we all showed up with food! A portent of things to come…. The photos are a series of individual head shots, not a group shot. I did take group shots later at PJ’s and at my own home when the gang showed up to be helpful. I am still wired from 10 days with kids, grandkids and parties. I will try to get one in today. Did just complete one and sent it. Short text, letting Superior images doing the talking. I’ve got a few in the hopper. Just nothing yet in the outbox. Maybe today. I haven’t gone yet, but if the past is any indication, this is an amazing sale. He lives in a townhouse and both his and his roofmate’s garages and driveways are filled with hardcover, paperback, and children’s books as well as some vintage paperbacks, records, CDs, DVDs and audiobooks. Prices are low. Variety is enormous. I know few of us “need” more books, but Carl’s sale is worth the effort to check it out. Rats – I’ll be in Wisconsin on Saturday. My wallet just gave a huge sigh of relief! I could probably get to this, Caroline, thanks for the heads up! Thank goodness I won’t be able to make it to this. One reason is youngest daughter and I are having a book sale Saturday afternoon. 2- Smartphone screens are NOT species specific. Little foster menace can swipe the screen, although I have not caught her “liking” anything yet. Piper the Westie pup is adept at changing TV channels and bringing up odd screens of which we don’t know the meaning, or in some cases, how to get rid of without turning off the set. Oh no! His Terrier intelligence is starting to emerge. No! Learn from him. Terriers are so smart and funny. I love terriers.